Only moments away from the many activites in and around Boulder, the Hotel Boulderado is centrally located downtown, one block from the city's award winning pedestrian mall. 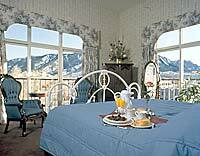 Many of the Hotel Boulderado's 160 guest rooms and suites feature magnificent views of Boulder and the Rocky Mountains. In addition, the hotel has an excellent restaurant, two lounges and a unique gift shop.